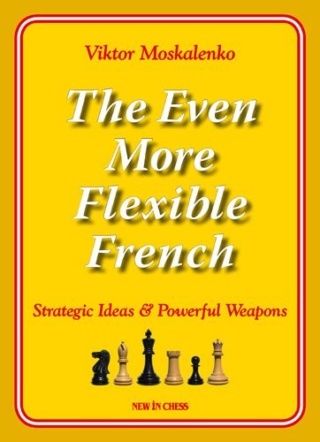 When Viktor Moskalenko’s 'The Flexible French' appeared in 2008, it caused a sensation. 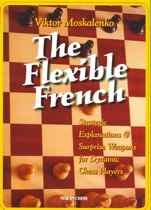 The Flexible French by GM Viktor Moskalenko is an opening book that defies easy characterization. It’s certainly not an encyclopedic guide, which would require at least 1000 pages for the French. Rather it is a cross between an opening repertoire book and the short, focused articles found in the Dangerous Weapons and Secrets of Opening Surprises series. The common link in the material, with the possible exception of 3…Be7 against the Tarrasch, is that it has been played repeatedly by Moskalenko. Each of these is organized as follows: Historic origin of each variation, which includes main ideas, resources, advice, analysis of the most interesting lines through model games, illustrative games, statistics, summaries, and conclusions. The same format is used for chapter 7, entitled Russian Roulette (aka the Zakharov variation) where the author changes tack and fights against his favorite, advocating the aggressive new weapon against the French – 1.e4 e6 2.d4 d5 3.Nc3 Nf6 4.e5 Nfd7 5.Nf3 c5 6.dxc5 Nc6 7.Bf4 Bxc5 8.Bd3 f6 9.exf6 Nxf6 10.Qe2!? 0-0 11.0-0-0. This line is dramatically different than the old treatment with short castling. Moskalenko devotes 19 pages to this system, which should appeal to aggressive players who want to limit the amount of material they need to study. Moskalenko does note that this variation can also be reached via 1.e4 e6 2.Nc3 d5 3.Nf3, which eliminates the need to have a way to meet the Winawer, and briefly examines 3...d4 (3...Bb4 – Short and Huebner and 3...Nf6 4.e5 Ne4 – Romanishin are unexamined alternatives) 4.Nce2 c5 5.c3 Nc6 6.cxd4 cxd4 7.Qa4 Bc5 8.b4! I agree with the assessment but the problem with this move order, which is not mentioned, is the tricky 6...Nf6 with the point that 7.e5 Nd7 8.dxc5 Ndxe5 9.Nxe5 Nxe5 10.d4 is met by 10...Bxc5! as played by Mamedyarov, Shulman and Socko who all won with it, admittedly against lower-rated opposition. It looks to be a clean equalizer, which may explain why young Turks of this line like Zubarev and Nepomniachtchi have preferred 5.d3 and 5.Ng3 respectively. The lack of detailed coverage of alternatives to 3...Nf6 is not that big a deal. Moskalenko is approaching the position from the move order 1.e4 e6 2.d4 d5 3.Nc3 Nf6 not via the Two Knights. Since both lines require White to have a knowledge of the Rubinstein variation (Black can always play ...dxe4) a practical way for an aggressive non- theoretical player to meet the French might be 1.e4 e6 2.d4 d5 3.Nc3 using the Zakharov variation against 3...Nf6, choosing a line against the Rubinstein and meeting 3...Bb4 with something like 4.Qd3. The latter is of particular interest because this line, despite being given in John Watson’s PLAY THE FRENCH (FM Hans Olav Lahlum wrote the chapter), does not enjoy the best of reputations. Moskalenko has a very specific idea how to rehabilitate it. After 1.e4 e6 2.d4 d5 3.Nc3 Bb4 4.e5 c5 5.a3 Bxc3+ 6.bxc3 Qc7 7.Qg4 f5 8.Qg3 not the commonly played 8…cxd4 or 8…Ne7 but 8…Nc6 delaying the exchange on d4 to sidestep Ne2-f4. He offers many of his unpublished games to support the argument that Black should aim for …Bd7-e8-g6 instead of the more commonly seen plan of …b6 and …Ba6 (when Black has opted for 8…cxd4 or 8…Ne7). Moskalenko has an engaging and entertaining writing style that livens up this book. It was hailed by reviewers from all over the world as eye-opening, full of new ideas, easy to read, sparkling, and inspirational. The book contains a more or less complete French repertoire for Black. Yet Moskalenko also presents quite a few weapons and opportunities for White. The Ukrainian Grandmaster’s analysis is, as before, high-level, his touch has remained light and fresh. Viktor Moskalenko (1960) is an International Grandmaster and a well-known chess coach. The former Ukrainian champion has won many tournaments in Spain, his new home country. He is the author of The Fabulous Budapest Gambit (2007), The Flexible French (2008), Revolutionize Your Chess (2009), The Wonderful Winawer (2010), The Perfect Pirc-Modern (2013), and The Diamond Dutch (2014). "Moskalenko does an excellent job of explaining what Black is aiming for and the 103 model games this book is structured around make it more user friendly for amateur players than the traditional opening book." "All French players wishing to refresh their repertoire should examine this work, both for new ideas in the main lines and some tricky surprise weapons." "This isn’t just a slapdash reprint where a couple of words have been changed. This is a meaningful update to in-depth content." "Anybody over 1800 should seek out a copy as, believe me, White does not have it all his own way. Forty years of defending Frenches emoboldens Your Editor to add: Why didn't you say before?" "Twelve new chapters, almost a hundred extra pages, dozens of new analysed games and a more accessible arrangement of chapters: the reader gets his money's worth." "More than just an expanded update (..) It has become a complete new book!" "The analysis simply sparkles with ideas." "Moskalenko's coverage is excellently balanced. Easy to read and understand; even weaker players will benefit from Moskalenko's breakdown of the material."